What does it mean to be “friendly”? List at least 5 friendly actions. Do one of those actions on the list. How did the other person act when you were friendly? What are some things that more people could do—or just do more often—to make the world a friendlier place? Describe how you show friendliness during a typical week or make a poster or collage that describes what it means to be friendly. People often become friends quickly when they share something about their lives, their values, and other things that are important to them. With your advisor or a parent/guardian, interview three people in your congregation to find out a) what brought to them Unitarian Universalism or to your congregation, and b) which of the Seven UU Principles are most important to them. 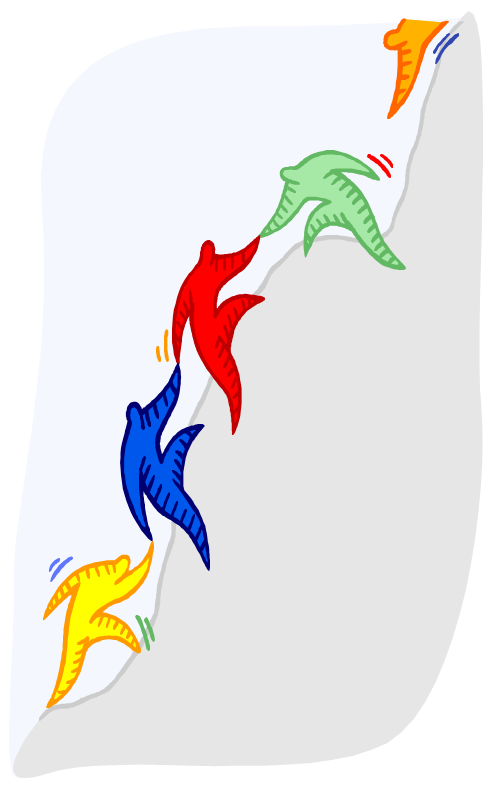 You can find clip art for Animal UU Principles on the website of the UU Metro New York District. Used with permission. What did you learn about the three people during your interviews? What was it like to share ideas and opinions? How were those conversations different from conversations about such things as the weather or the snack menu? Did your conversations make your relationships with the other people more like friends and less like “acquaintances” (people you know just a little bit)? Talk over with your advisor/parent/guardian the experience you had doing the interviews and what you learned. Choose A, B, or C.
Whom can you help? Draw a dot in the center of a large piece of paper. 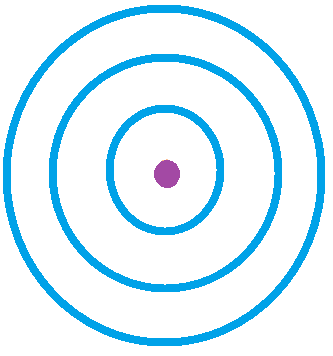 Now draw 3 circles around the dot, each circle bigger than the next, so that you end up with something that looks like an archery target. HINT: You can trace bowls, plates, or other circular items of different sizes. Pretend the dot in the center is you and the three circles are people whom you can help. The closest circle includes your family and the people you live with—the people who share your home and care for you. Those in the next circle as you reach out are people you know who are not part of your immediate family. Who are those people? Friends at school, people in your congregation, your neighbors? The next circle after that includes people you don’t know who you can help, such as those in your community or in the wider world. Who are some of the people in that third circle? In each circle, list two or three ways you can help one or more of people in that circle. Do you need to learn more to know what would be helpful, especially for the people in your third circle? Are the ways you can help similar or different for the people in each of your three circles? Why? What kinds of help do people in each of the three circles expect from you? How are the expectations different from those who live with you, those who know you outside of home, and those who don’t know you at all? Explain how you help people now. What could you do to be more helpful? Learn or review the story that girls learn when they become Brownie Girl Scouts. HINT: The story can be found in Brownie Girl’s Guide to Girl Scouting. There are also many versions that can be found on the internet, including videos and other productions done by Girl Scout themselves. Who helps whom in the story? Fun Fact! 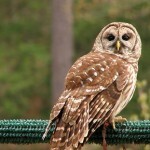 In the early years, Brownie leaders were called “Brown Owls.” How is the Brown Owl like a Girl Scout leader? What does the story teach girls about being helpful? How do you help out around your home? Are you more like the child(ren) in the story before they meet the Brown Owl or afterwards? Whom do you know in real life who offers advice like the Brown Owl does in the story? List ways you help out at home with daily or weekly household tasks. Is there anything you could do or should do to be more helpful? Create a colorful chart of the ways you help at home already and the ways you promise to try help in the future. You might decide create your list on your computer or electronic drawing program using interesting type faces. “The Good Samaritan” can also be found in the Tapestry of Faith curriculum Resistance and Transformation. Learn what a Good Samaritan Law is and how it relates to first aid. How does the story of “The Good Samaritan” relate to prejudices in Jesus’ time? How do Good Samaritan Laws help people help others? Participate in three acts of service for your own congregation: one individually, one as part of a group of two or more people, and one more either by yourself or as part of a group. Compare the three services you like to work individually or with others, and which one(s) you enjoyed most and least. How might you like to help in your congregation in the future? Tell someone about your experience doing service in your congregation or community. You might write a short article for the congregation’s newsletter, visit an RE group younger than you are to explain what you did, or find another way to tell others about your experience.